The AL1782 integrates two low-side current sinks which allow LED strips or LED bulbs to be connected in the common-anode topology for increased effectiveness and power optimization. This IC is designed with the power optimization in mind whenever there is no valid PWM signal on its input pins, it enters the low-power mode, preventing unnecessary power dissipation. An additional ADC IC is used, allowing advanced power optimization. Offering good reliability, linear dimming response, and low power consumption, Light Temp click is a perfect solution for smart lighting applications, SCL LED bulbs, but also for driving LED strips and high-power LEDs. Light Temp click is based on the AL1782, a dual-channel PWM dimmable linear LED driver by Diodes Incorporated. It is a constant-current driver, which can sink up to 1500mA combined, or up to 750mA per channel. It has two low-side current sinks which allow LED strips or LED bulbs to be connected in the common-anode topology for increased effectiveness and power optimization. Note that the constant current on this Click board™ is set to 750mA per channel. The AL1782 IC can be operated with a PWM signal in the frequency range from 1kHz to 40kHz. By applying the PWM signal with the duty cycle of less than 4ms, it is possible to tune the light intensity of the connected LED light element. A LOW pulse width of more than 4ms will set the device into the low-power mode (suspend). The lowest light intensity that can be reached by applying the PWM frequency of 1kHz is 0.1%, while 40kHz allows the lowest brightness level of 4% of the full light intensity. A High PWM frequency allows for less visible flickering, but limits the lowest light intensity level, at the same time. 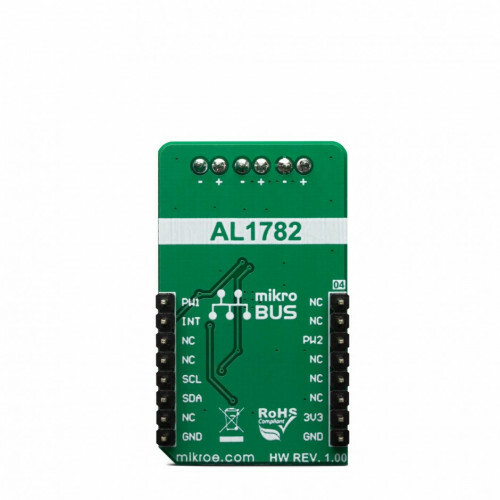 PWM1 and PWM2 pins of the AL1782 are routed to the mikroBUS™ PWM and CS pins and are labeled as PW1 and PW2. Adaptive Thermal Management (ATM) scheme is one of the key features of the AL1782. It can be used to optimize the power consumption by adjusting the voltage of the external power supply unit (PSU): the excessive voltage applied to the connected LED will be dissipated as heat within the AL1782 IC. Therefore, the voltage level of the external PSU should be kept above the forward voltage of the connected LED plus minimum voltage headroom (VF + VLED_REG). The ATM injects current through the LEDPG pin of the AL1782. This current is converted to a voltage level, and it is sampled by the MCP3221, a low-power 12-bit A/D converter with I2C interface, by Microchip. It has its I2C pins routed to the respective mikroBUS™ I2C pins, allowing the host MCU to read the LEDPG voltage and make PSU voltage adjustments. Please note that if an external PSU with no external regulation is used, its voltage should stay within the mentioned range (VF of the connected LED element + VLEDx_REG as per AL1782 datasheet). However, the voltage should always stay below 30V. The AL1782 IC also integrates an abundance of protection features for increased reliability: undervoltage, open or short circuit at the output, and thermal protection. If any of these protections become activated, a fault event will be reported on a dedicated pin, labeled as FAULTB. This pin is routed to the mikroBUS™ INT pin and it is asserted to a LOW logic level when a fault event occurs. Deep Dimming Capability helps with power efficiency. Subjective perception of the light intensity differs from the measured light. For example, the light intensity of 10% (in respect to the applied duty cycle) is perceived as 32% of the full light intensity. Deep Dimming Capability helps with energy saving, providing an optimal light output. 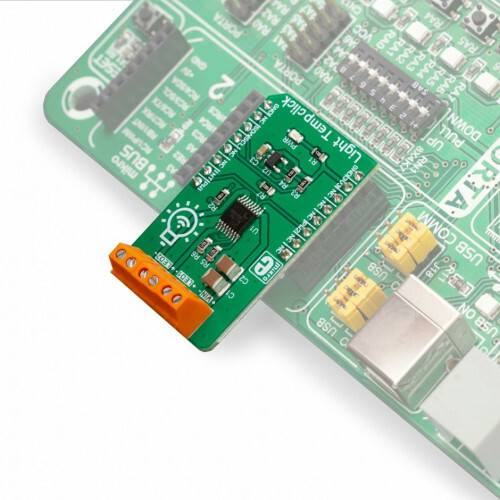 Deep Dimming down to 0.1% is possible with the AL1782 IC, since it can be operated with the pulse width as low as 1 µS, while still providing good linearity. 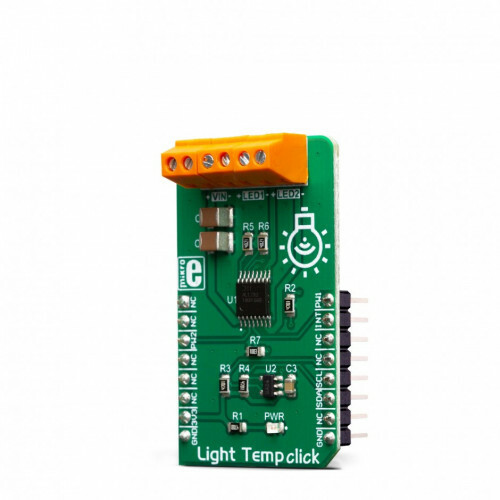 Light Temp click is designed to be used along with an external PSU and an MCU. 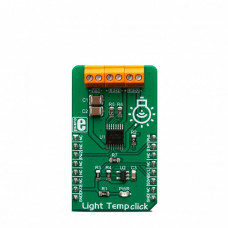 The full potential of the Light Temp click is achieved when combined with a dedicated light temperature and color sensing Click board™ such as Spectral click: by receiving information about the ambient light color temperature and white balance from the Spectral click, the MCU can generate PWM signal in respect to the required CCT tuning and send it to Light Temp click to regulate the color of the ambient lighting. 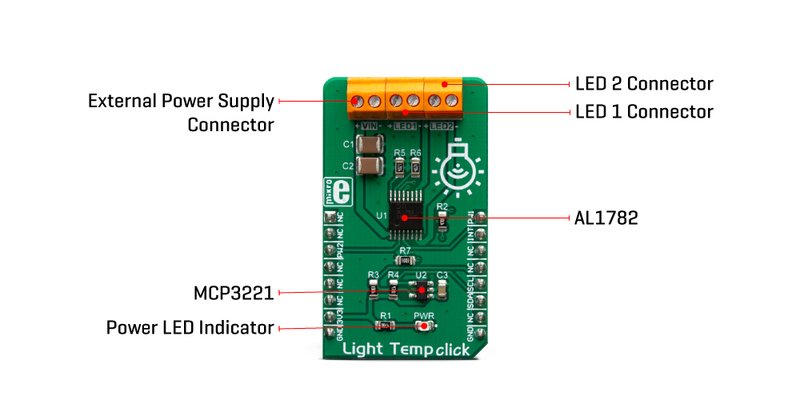 Applications Light Temp click is a perfect solution for smart lighting applications, SCL LED bulbs, but also for driving LED strips and high-power LEDs. On-board modules AL1782, a dual-channel PWM dimmable linear LED driver by Diodes Incorporated; MCP3221, a low-power 12-bit A/D converter with I2C interface, by Microchip. This table shows how the pinout on Light Temp Click corresponds to the pinout on the mikroBUS™ socket (the latter shown in the two middle columns). 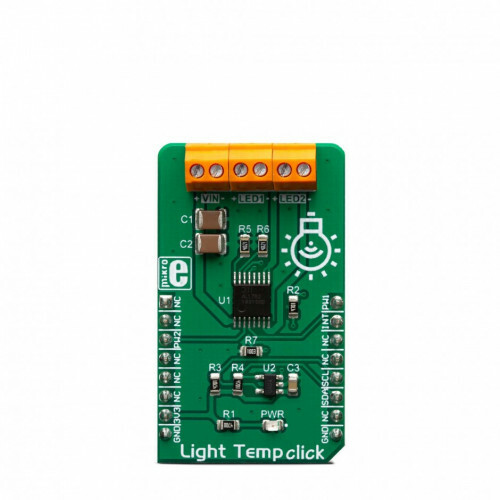 We provide a library for the Light Temp Click on our LibStock page, as well as a demo application (example), developed using MikroElektronika compilers. The demo can run on all the main MikroElektronika development boards. Library provides full control of the illumination for 2 LEDs. PWM functions are used to control the brightness temperature of the LEDs. The library also offers reading the current PG voltage score that serves to regulate lights and alerts. uint16_t lighttemp_getPGVoltage() - Reads PG output voltage. uint32_t lighttemp_pwmInit(uint8_t ledNum, uint16_t freq) - PWM init functions. void lighttemp_pwmSetDuty(uint8_t ledNum, uint16_t duty) - PWM set duty cycle.